CMON Games has set a launch date and time for the Kickstarter campaign for their board game adaptation of Bloodborne. 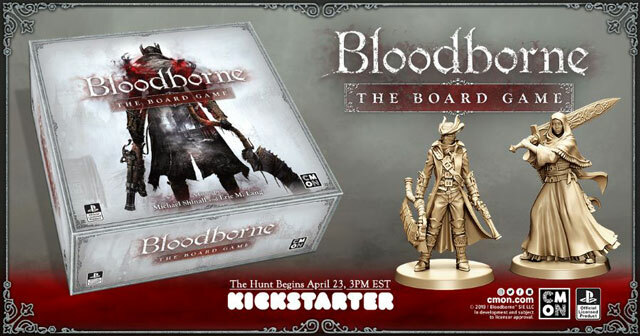 Unpretentiously called Bloodborne: The Board Game, the game’s crowdfunding is going up on April 23rd at 3pm EST. So, if playing Bloodborne in the form of a board game sounds interesting to you, keep your ear to the ground on Kickstarter in ten or so days. It’s difficult to imagine how exactly a game like Bloodborne would work as a board game. But, well, that hasn’t stopped CMON Games. In fact, they’ve already released their adaptation of Bloodborne as a card game. As far as I can tell, people liked it pretty well; it even got an expansion. However, Bloodborne: The Board Game is going to be a full-fledged board game, with miniatures, cards, the whole shebang. If you want to support the game, then keep your eye out on Kickstarter on April 23rd at 3pm EST. Right now, there’s no info on what the game’s price will be, nor what the different tiers for Kickstarter supporters will be. We do, however, have some details about the game itself. For one, we know that the people behind the game are Eric M. Lang and Michael Shinall, both of them veterans, so the game is in good hands. If you don’t believe me, then check out the Bloodborne board game design diary to see how deep into details the designers are going into. The game is going to be some sort of “campaign-based action-adventure”, in which up to four people will take on the mantle of Hunters and face the many monstrosities of Yharnam. You’ll get to use a bunch of Trick Weapons, as you might expect. The combat will be based on cards and deck-building, and also, there will be consequences for different choices you make. Just like in Bloodborne proper.